We can provide a number of Cutting and Welding Services catering for most needs, including hand plasma to 80 amp, CNC laser to 20mm (charged at $400 hr Plus drawing conversion, plus Material), and some General Tool Hire. Both Our Shed Or Home Workshop is Available for Supervised Hire. Deagon is the location for the Heavy and Repetative Forging, a small Industrial Shed, Houses the Air Hammer, Hydraulic Press, Hydraulic Bar Twist, Hydraulic Band Saw, 80 amp plasma cutter, Gas Forge/Furnace, 3/4 and Morse Taper Drill Press, And More. Basically, A Very fully Kitted out Blacksmith Workshop. Eagle Farm is the Home Workshop for most supplies and Manual General Forging, Fabrication, and Teaching. 40 amp hand plasma cutter, Full Oxy Setup, AC/DC Stick, Tig and mig, and Both Areas are equiped with charcoal and gas forges. The home workshop is where you will be if you want a taste of blacksmithing. 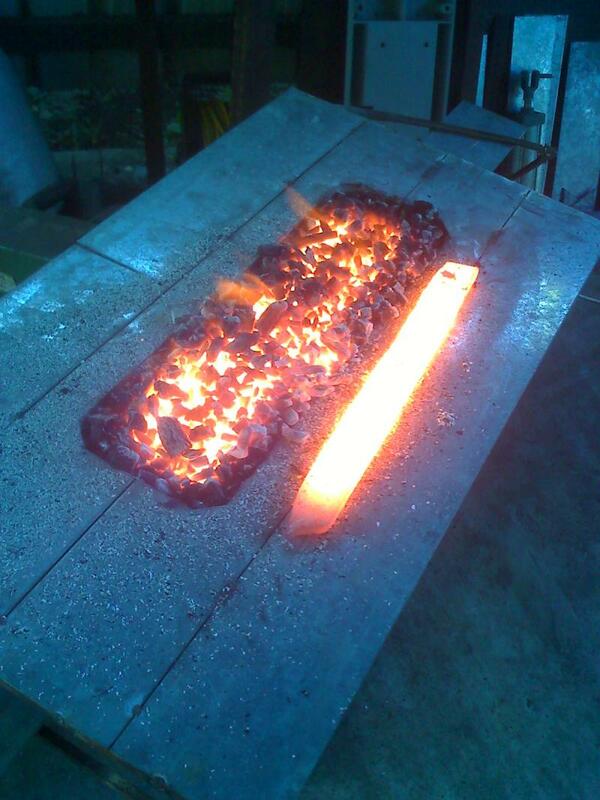 This Medium Long Charcoal Forge, easily heated the 20 inch by 2 inch by 1 inch toolsteel bar.